Stephen Schwarzman and Jared Kushner captured in black tie together in 2007 around the time the Donnell Library sale was being concocted. Schwarzman with Trump running his economic forum where the public infrastructure he wants to privatize was discussed. 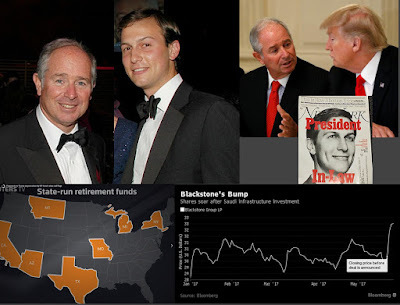 Graph information about the benefit Schwarzman's Blackstone is getting from a Kushner-negotiated deal with Saudi Arabia for selling American infrastructure and where public employee pension fund money is being taken from to benefit the Trump family. New York Magazine dubs Kushner the nepotistic "President-In-Law." Last August when the New York Times reported on the economic benefits of being politically connected to Donald Trump as president (The Benefits of Standing by the President, by Jessica Silver-Greenberg, Ben Protess and Michael Corkery, August 19, 2017) it came up with an impressive seemingly one-stop-shopping list of real estate deal connections between presidential son-in-law/advisor Jared Kushner and presidential advisor Stephen A. Schwarzman, the head of the Blackstone Group. Of course, the bigger topic lurking was conflicts of interest. As impressive as the list was when compiled, the question is what did it still leave out? One thing it left out was the a library shrink-and-sink deal, the sale of the Donnell Library once owned by the NYPL, for a minuscule fraction of its value in what was essentially a no-bid transaction arranged in secret. • In 2013, (before Mr. Trump was a candidate), Blackstone financed the purchase of warehouses and industrial buildings by Mr. Kushner’s family company. • Blackstone also made a loan, which has since been paid off, to Kushner Companies on a Rector Street property (2 Rector Street) in Manhattan. • In the summer of 2016, an entity controlled by Blackstone lent $376 million to Mr. Kushner’s company to purchase a large property in Brooklyn that the Jehovah’s Witnesses had operated for many years. • Separately, Mr. Kushner and his wife, Ivanka Trump, invested up to $500,000 in a fund that Blackstone manages. • Mr. Kushner and his wife, Ivanka, attended what many described as the obscenely lavish 70th birthday party Mr. Schwarzman held for himself in February 2017 at his home in Palm Beach, Fla., near Donald Trump’s Mar-a-Lago estate. A few months before the Times article, Bloomberg News zeroed in on the Kushner Schwarzman connections. See: Kushners' Blackstone Connection Put on Display in Saudi Arabia, by Caleb Melby and Hui-yong Yu, May 25, 2017. 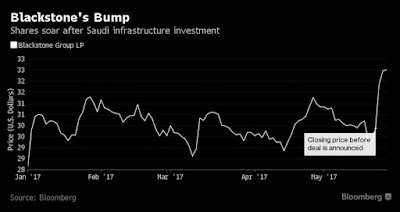 When Saudi Arabia announced last week a $20-billion investment in a U.S. infrastructure fund managed by Blackstone Group LP, many noticed that it came shortly after presidential son-in-law Jared Kushner personally negotiated a $110-billion arms sale to the country. What went unnoticed -- and is largely unknown -- is how important Blackstone is to the Kushner family company. Since 2013, Blackstone has loaned more than $400 million to finance four Kushner Cos. deals -- two of which have not been reported -- making it one of the business’s largest lenders. And their ties go beyond the loans. Stephen Schwarzman, Blackstone’s co-founder and chief executive officer, heads Trump’s business-advisory council and was in Riyadh with the president and Kushner. The Saudi promise to invest in Blackstone’s fund drove the firm’s stock up more than 8 percent. Dozens of chief executives from across the United States faced pressure over the meeting. Some of them, speaking on the condition of anonymity, said they had felt they had no choice but to go if they wanted to do business in Saudi Arabia. Nevertheless, the Times probably figured that they were leaving a sufficient trail of crumbs for any readers priding themselves on being astute about such things to read between the lines and between the ambiguity and the denials. That includes those readers who would intuit the sort quid pro quo they consider abominable, as well as those eager to know what Mr. Kushner and Mr. Schwarzman are up to so that they can keep up with the competition and abreast of the latest tactics and status of what people can get away with. This lack of transparency is an essential ingredient of the story. It should not be glossed over. It was wrong for the Times to neglect to mention it. The Times did eventually report separately about Kushner’s lack of disclosure (separately is not such a good thing), but in another example of the Times lagging months behind, it was finally reporting only in November about non-disclosures previously reported by others. The potential conflicts extend from the cabinet to the West Wing. Mr. Trump’s son-in-law, Jared Kushner, an adviser whose portfolio ranges from Middle Eastern peace to government technology, revealed over the summer that he had failed to disclose dozens of assets on his initial government ethics forms. See: Too Rich for Conflicts? Trump Appointees May Have Many, Seen and Unseen, by Nicholas Confessore, November 10, 2017. The deal, which was not made public, pumped significant new equity into 10 Maryland apartment complexes controlled by Mr. Kushner’s firm. When the New York Times finally got around to reporting about the nondisclosure of potential conflicts of interest by Kushner on his ethics forms and other Trump advisor/associate ’s business engagements that are generating potential conflicts of interest, it reported that among the investments Mr. Kushner initially failed to publicly disclose was a real estate technology start-up called Cadre. As “Thrive Capital” Jared Kushner and his brother Joshua Kushner are backers and strategic advisers to Cadre. Cadre’s offices are in the Kushner owned Puck Building. In other words they are very much involved. Every day, I speak with Josh Kushner. Josh, an investor through Thrive Capital, brings his tech domain expertise. He played an incredible role early on helping to seed us and give us the capital to build the business. Josh and Jared are both like brothers to me. Jared was an adviser and not involved operationally day to day. He was always a great sounding board for us. Assessing this undisclosed close business relationship that Jared has with his brother Josh, it is worth bearing in mind that when Jared Kushner wanted to contend that he was taking appropriate steps to deal with his conflicts of interest he transferred some of his questionable assets to brother Joshua and to a trust overseen by his mother. Such laughably useless gestures are the family M.O. when it comes to ‘resolving’ conflicts of interest with Donald Trump putting his own business interests in the hands of his sons, Eric and Donald Trump Jr. Ivanka, Trump’s daughter and Jared’s wife, similarly retains the benefits of her business “empire” through such trust and close family relationships. The Times has editorially worried that the Saudi Arabian government might try to exercise influence over Donald Trump through companies that Trump Organization recently established in that country wanting to do real estate deals there. Meanwhile, one of the Trump Saudi trip deals, unveiled concurrently with the Schwarzman infrastructure privatization investment and the arming of the Saudis, was for the Saudis to put $100 million into the hands of Ivanka for a “new foundation” she was proposing. When quid pro quo arrangements (possibly illegal) are bilateral, i.e. people connected by being each on one side of a single transaction, it is easier to conceptualize, comprehend and identify them. When organizations are huge, diffuse and ubiquitous, identifying problematic conflicts of interest can be much more challenging. Some people think it’s sufficient to conclude that the system is defective if you know powerful players view themselves as all being in the same club looking out for each other. Maybe so, but with multiple players and possible combination there are a lot of variations in between the simple bilateral and the `we are all in the same club' mentality. They can be very hard to spot. When Connecticut Governor John Rowland resigned in 2004 in a bribery scandal one of the bribery schemes that was uncovered was an exceedingly difficult to detect three-way: Bribing the governor by having an antiques dealer pay him nearly twice the legitimate value when purchasing a condominium from him, while one step removed, that overpayment was funded and reimbursed by a business man who had the real interest in bribing the governor buying antiques from the dealer at an inflated price. How do you spot these things, or know with any certainty when they have or have not happened? • Kushner’s $340 million purchase of the Jehovah’s Witnesses Watchtower (“one of the biggest real estate transactions in Brooklyn history”). • 200 Lafayette Street, an office building. • 2 Rector Street, an office building. And the article reports that CIM has gotten a great deal of its money from public pension funds. This, with concerns of pay-to-play overtones when political donations are made, is something that Schwarzman’s Blackstone has also been involved in. 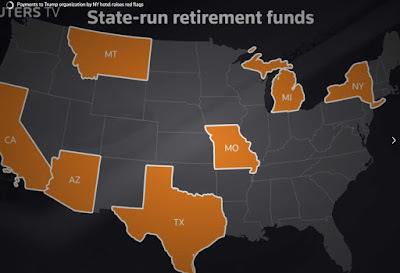 WYNC links to the information that public employee pension funds in at least seven states (California, New York, Texas, Arizona, Montana, Michigan and Missouri) have invested in a CIM fund benefitting Trump and his family. From Reuters, the seven states where the money from public employee pension funds is going to help the Trump family. As noted, WNYC was sniffing for problematic overly-cozy bilateral arrangements. • The Blackstone Group provided a $360 million loan to CIM Group to finance 1440 Broadway according to a December 21, 2017 article in the Real Deal. Conflicts of interest in government are a diminishment of the public realm because they mean, by definition, that decisions being made are slanted to be more beneficial to private interests than to the public whom government officials are supposedly in office to serve. The idea that the public realm is susceptible to being sold off is what then makes infrastructure deals, selling off publicly owned American infrastructure, just as Schwarzman’s fund is setting up to do, such juicy attractions for the greedy. The private plundering of the Donnell Library with Kushner on one side and, on the other, Schwarzman in a position of public trust as an NYPL trustee, is a prime example of just how heinously detrimental to the public the looting of its assets can be. . . But we are increasingly at the mercy of those in power who would seek to enrich themselves by diminishing the public realm, claiming its various dismantled parts as their own territory. One final symbolic irony, perhaps even an irony that’s forcefully intended: In 2011 a new slogan was raised, a cry adopted and resonating across the country, recognizing the public as the “the 99%” while power and wealth were being wielded with increasing destructiveness by the “1%.” It was raised by Occupy Wall Street a protest movement that took to the street and seized Zucotti Park in New York City in order to be publicly heard and seen. Zucotti Park was once named Liberty Plaza Park, before it was renamed in honor of a real estate lawyer. . .
I’ve written previously in Noticing New York about how Zucotti Park and its occupation directly raised the question of the public realm and how we are shrinking the public domains both physical and cultural that the public is still permitted to occupy. Although Zucotti Park is dedicated and supposed to be for the public, it is technically privately owned by an adjacent property that got zoning bonuses for providing the public with the park. Ever since Occupy Wall Street was forcible evicted from the park, tight private ownership control has been exercised over the park to ensure that such meaningfully expressive protests don’t erupt there again. The latest news about Zucotti: Schwarzman’s Blackstone acquired 49% ownership* of it and the adjacent building. A trophy intended to be symbolic of someone’s victory?